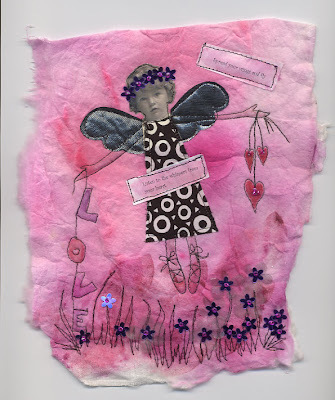 I am back joining in the fun on Inspire Me Thursday and the promt is child art. Well, this is my mum as a child (she's 87 now) and this picture came to light last year. I have had so much fun using it in many ways. This piece is dyed cotton wool paper and applique with hand stitched sequins and beads and the letters and hearts are hand painted. Fabulous! It's even more so knowing that it is a family picture and has sentimental value. Oh, how perfect to convert that angelic face to an angel. She was a beautiful child--I bet she is a lovely elder!